For many parents, the thought of taking their toddler camping sounds like an absolute nightmare! However, it’s not as difficult as you might think. Will it be a little more stressful? Absolutely, but it’s also a LOT more fun. Toddlers love the outdoors, so naturally they’re going to really enjoy a camping experience. Think of the adventures and the memories you can create together. With a little preparation, you can ensure your camping trip goes without a hitch. Ready to get prepped? 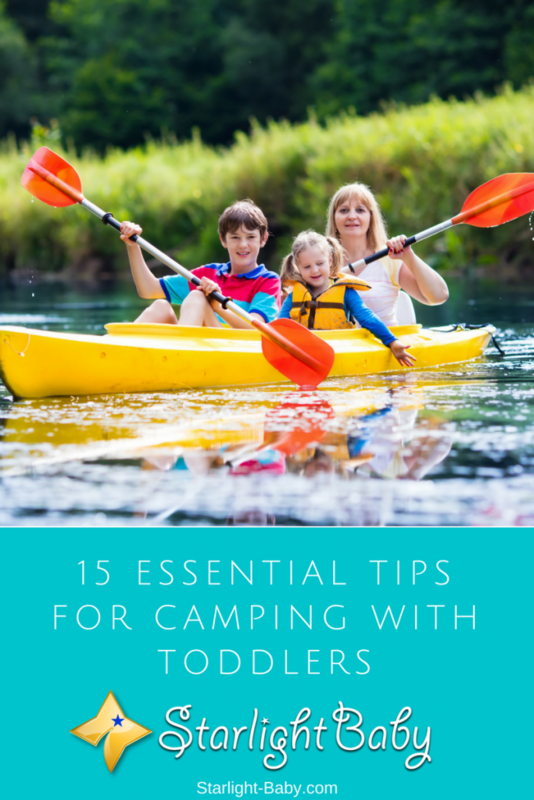 Check out the 15 essential toddler camping tips below! Sure, you’re cozy two-man tent may have proven luxuriously spacious for you and your partner, but is it going to give you plenty of space with a toddler in there too? When choosing the right size, think big! The more space you have to move around in, the better. This is especially true if you’re planning on going to bed later than your toddler and you don’t want to risk waking them up when you finally do head to bed. It could even be a good idea to invest in a tent with multiple rooms. This is actually really practical as it gives you the option to hide potentially dangerous objects, such as cooking knives, in one of the other rooms away from your toddlers reach. Of course, it goes without saying the quality should be good too. It should provide plenty of shelter and there shouldn’t be any jagged edges which are often found on poor quality tents. Air beds tend to be the most common choice for parents camping with toddlers. However, as you’ll likely already know, air beds also deflate frequently. You’re already going to have a enough to do without having to worry about blowing up your toddlers bed, as well as your own each day. So, instead of giving your little one an air bed, consider taking a toddler specific bed with you. This could be a toddler mattress, or a sleeping mat designed specifically for toddlers. They might be a little more expensive to purchase if you don’t already have one, but the stress and time it saves you is definitely worth it. Before heading off on your family camping adventure, it’s a good idea to carry out a test run. Set up the tent in the back yard and see how well your toddler does sleeping through the night. You can also use it as an opportunity to make a note of anything you’ll need to take with you that you might have forgotten, and any potential issues which could occur that you might not have planned ahead for. By carrying out a test run, it gives you a good idea of what to expect and also prepares your toddler for it too. This isn’t going to be easy, but try to stick to your toddler’s daily routine on the camping trip. That means, trying to get them to nap at the same time as they would at home, eat at the same time and put them to bed at the same time as usual. The less disruption to their routine, the fewer problems you’ll have when you get back home. However, it’s worth noting that it’s highly unlikely you’ll be able to stick to the exact same routine Camping is new and exciting for your toddler so there’s bound to be some disruption. They may nap for shorter periods of time, or even not at all. So, don’t be too rigid, but don’t let the routine go completely. There’s a lot of extra things you’re going to need to take camping when your toddler is with you. Depending upon where the campsite is, you’re going to need a good supply of food, diapers if your toddler is using them and drinking water. You’re also going to need a LOT of wipes! They’ll become your “go-to” savior on the trip. Food wise, obviously focus on foods which aren’t going to spoil in the outdoors. This includes bread, sausages, eggs, peanut butter and snacks. Think about the facilities available at the campsite and the foods you’re likely to be able to prepare. New toys can help in many situations and camping is no different. Whether you simply buy a new camping book to read to your toddler at bedtime, or some cool new outdoor toys to keep them occupied; you don’t need to spend a fortune, just one cheap new toy will do. In fact, the best idea is to take a selection of old and new toys. The old toys can give your toddler comfort if they feel overwhelmed by the new camping experience. While many toddlers love experiencing new places, and will see camping as an exciting adventure, others may feel a little more apprehensive. So, giving them some old outdoor toys they’re familiar with can really help to ease their worries. Even if you’ve followed the advice in tip #2, it won’t guarantee your little one won’t wake up in the middle of the night. They’re in new, potentially scary surroundings. So, even if your toddler usually sleeps through the night, they could develop temporary sleep issues throughout the camping experience. For this reason, it’s worth coming up with a plan of action if they do wake up. Some parents have even resorted to driving their toddler around in the car until they fall asleep. How will you handle it? A comfort blanket or stuffed toy? Having a plan will help to ease the situation, ensuring you can all get back off to sleep as quickly as possible. If you’re planning on camping for more than a couple of days, it’s a good idea to make sure you’re heading somewhere with ample activities available. Toddlers love camping, but they do get bored quickly. So, if there aren’t many activities outside of the camping area, you could end up faced with some potentially fierce tantrums! Be aware that the popular campsites do get booked up quickly. So, it’s best to book at least six months in advance when you can. The internet is a fantastic source of inspiration, so get online and compare the different campsites in your area. Another thing to keep in mind when choosing a campsite is the facilities onsite. Are there showers available? At the very least you’re going to need a site which offers somewhere for your toddler to go to the bathroom. Different campsites have different facilities and some will even offer toddler friendly play areas. So, it’s worth looking for a site which offers plenty of family-friendly facilities. Toddlers love to learn; especially when they’re given interactive learning experiences. Teaching them about the plants around the campsite isn’t just interesting – it’s also a great safety precaution. Numerous plants can be dangerous when touched, so it’s worth checking to see whether there’s any in the area such as poison ivy. There may also be berries close by, some of which cannot be eaten. So, teach your little one about the different types of plants and which ones they shouldn’t touch. Experiences like these are great for teaching unique and valuable lessons. Hiking is one of the most popular camping activities and it can be a fantastic bonding and fun experience. However, when you’re heading out hiking with a toddler, it’s important to ensure you’re choosing an age-appropriate trail. Your toddler can’t hike at the same level as you can. They have very little legs which quickly become tired. They also don’t do that great at higher elevations. So, try to stick to flat, short hikes; especially if they’ve been running around and exploring the campsite earlier in the day. If you’re struggling for ideas to keep your toddler entertained, a nature scavenger hunt is perfect. Before you head off on your camping adventure, it’s a good idea to do a little research of the wildlife and plants in the area. That way, you can create a sheet with a list of things you’re likely to see, giving you and your toddler the chance to tick them off as you go along. You could even find some fun facts about the nature you’re on the lookout for and use it as an educating experience for your little one. You can even find some pre-made nature scavenger hunt sheets online. Simply find one which best matches the campsite you’re going to and print it off before you go. This is a great way to make camping more fun! Your toddler is going to be burning off a lot more energy while camping so it’s important to ensure their levels are frequently topped up. Healthy snacks will help to ensure your little one’s energy is topped up throughout the day, while also ensuring they don’t become over-tired or grouchy if they get hungry. Have plenty of different snack options including sweet and savory options so there’s less chance you’ll have to suffer snack-based tantrums. Sure, camping can be great for trying out delicious, fire-roasted foods such as skewered artisan sausages and chocolate coated pineapple rolled in coconut. However, when you’ve got a toddler, you’ll soon discover there’s little time to create elaborate, fancy meals. So, plan to cook simple, easy foods throughout the trip; particularly on the first night. This tip is genius for both keeping your toddler happy and ensuring their safety. Having their own little camping chair helps to make them feel like a grown-up, and gives them a safe place to sit to view the campfire. Make sure the chair is placed at least five feet away from the fire and tell your toddler whenever they want to view the fire, they can only do so by sitting in their chair. The above are just 15 great tips to follow when taking your toddler camping. As long as you prepare well in advance, there’s no reason camping with your little one can’t be a super-fun, enjoyable experience. Have any camping stories or tips of your own that you’d like to share? We’d love to hear them! Me and my husband have been discussing taking our boy for his first camping trip for a while now and I think that we might just go ahead and do it in the next month. That’s why these tips are pretty on time! I especially like that you’ve mentioned that we should get our toddler his/her own camping chair. I would have never thought of this myself but it’s a great idea. It would make him feel part of the whole thing a bit more and he would feel like us, the grown ups. I have looked it up online and there are plenty of great options and none are too expensive! And yes, do get him his own camping chair because kids really love to feel they’re also already grown ups, haha. Have fun! Great article just as me and my toddler we’re preparing for going camping! For sure this tips will help. Toddler like to walk(at least mine does A LOT) so camping is a good ideea for our family. Great to know you find the article useful. Sounds like you’ll be having a wonderful time in the great outdoors. Enjoy every moment of it with your family because kids grow up so fast, sometimes it’s already difficult to bring them along to camping because they would rather be somewhere else with their friends. Have fun! My nephew and niece, aged 8 and 6 years, will come to live with us soon. We are planning to go for a camping. Since I have never been to campign ith toddlers I am little worried on how to handle these toddlers. I found this article very enlightening. You have shared really useful and informative tips, I liked the idea of sticking to toddler’s routine and going on nature scavenger hunt. Amazing tips for any parent planning on going on a camp with their kids and babies. One thing I’ve come to noticed is that learning about certain tips like this always help prevent the aftermath issues of camping with the toddler, as parents, and that is the reason I say a big thank you to you for taking your time to give, in details, things to do to have a great camping with the baby. This is certainly an interesting piece of article on how best to prepare for a camping trip by any parent, including those that it’s their first time of embarking on a camping trip. It’s very detailed with lots of specifics on what to do and what not to worry. From my experience, it’s very vital to plan out extensively before going on a camping trip so as not to be caught off guard with stuffs the kids or toddlers might need to feel comfortable.